Our youth are the future, making it vital to invest in their present. Boys & Girls Club staff believes that any opportunity for youth to grow in leadership, work ethic, or other career development skills should be pursued. At the Boys & Girls Club of Hawaii, members of the Torch Club Program had opportunities presented to them with two field trips aimed towards career development and culture. 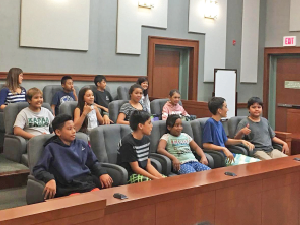 Youth were taken to the Kauai Museum to first learn local history and culture, and then to the Kauai District Courthouse to learn about the range of careers and skills needed to work there. The museum tour had Club youth learn about Kauai’s government hierarchy, and the social and political development of the islands. The next stop was to the Kauai District Courthouse, where Club youth received a personal tour around the premises and learned about the history of the district court judges and founders. They also had the chance to meet and greet with courthouse security, tech support, tellers, and the librarian to learn what their positions and skill-sets entail. With new advances in technology, youth learned that many courthouse hearings today are now digitally recorded, and those recordings need to be preserved and maintained. Courthouse staff explained that people with computer engineering skills are highly sought after for this reason. Youth were also taught the significance of jury duty, and why it is a requirement for citizens to participate. The field trips provided the Torch Club members at the Boys & Girls Club of Hawaii with practical and valuable insights into their local history, as well as the various career options available to them in the future. Like the Boys & Girls Club of Hawaii, Native Clubs are always looking for unique opportunities to provide their youth with the guidance and skill sets to thrive in whatever path their future holds.